Are you a former employee or an old fan of CJAY, CKY, KCND or CKND? Have any interesting stories about what happened behind the scenes or on-air? Then The View from Seven wants to hear from you! Read on, and then share with us your stories and your memories in the comments section below! Comments never close, and the readers keep on coming week after week. Dr. Andrew Stewart and his fellow members of the Board of Broadcast Governors (BBG) certainly couldn’t have been accused of going on a junket, arriving as they did in Winnipeg in the middle of January, 1960. As the members of the BBG — which regulated Canada’s airwaves from 1958 to 1968 — and a crowd of observers gathered in a seventh floor meeting room at the Fort Garry Hotel, the city outside was enveloped in a dull, grey light freezing drizzle that started in the morning and continued into the mid-afternoon. It was a good day to be indoors watching the meeting that was the talk of the town: the BBG’s public hearings which would determine who would be granted the valuable Channel 7 television licence that would finally break the CBC’s monopoly on Winnipeg television. The people gathered at the Fort Garry Hotel that day represented a Who’s Who of Winnipeg society. The first application was heard from R. S. Misener and Associates, backed by the Moffat family which owned Winnipeg’s CKY radio station, Investors Syndicate president T. O. Peterson and the owners of CKSB Radio in St. Boniface and CFAM Radio in Altona. The proposed station could be “a potent and positive force in our society… exploring new frontiers of the mind… and bringing about all that is good in our cultural community,” Misener vowed to the Board, before going on to present a programming schedule that included game shows, five-pin bowling, cooking and sewing shows and a Saturday late night movie called “The Owl Prowl”. The second application was presented by Red River Television, backed by Great-West Life chairman Joseph Harris, the Sifton and Richardson families, and Winnipeg Free Press publisher R. S. Malone. A morning “Breakfast Club” program based on NBC’s “Today” show would be the anchor program in the station’s schedule, along with local music and homemaker programs and a wide range of popular U.S. programs in prime-time. The final application was presented by Perimeter Television, fronted by CJOB founder Jack Blick and supported by lawyer Graeme Haig and other investors. Perimeter was vague on how it would program its station — which presumably would have operated as CJOB-TV — aside from a promise that its newsreaders would deliver the news in “perfect English”. Ultimately, the Misener application was given the green light. Later, the BBG — staffed at the time by appointees of the Diefenbaker Conservative government — would face accusations that licences were given out based on political considerations. The Misener group were reasonably discreet in terms of their political preferences, but could partisan considerations have cost Red River Television its chance at winning a TV licence, given the principals’ Liberal Party connections? William Hull noted in his 1994 book on the history of the Board of Broadcast Governors that the accusations of partisan favouritism mainly swirled around the granting of a Toronto Channel 9 licence to a group led by John Bassett, a well-known Conservative; and in permitting CKVR-TV in Barrie, Ont., whose owner happened to be a former Liberal candidate, to expand its signal to cover the lucrative Toronto market later in the ’60s. If there were any complaints about politics being a factor in determining the outcome of the Winnipeg hearings, they were discreet ones. Hull concluded that some members of the Board who were in charge of choosing a licence winner were “actively involved in partisan political activities, and some clearly looked for some personal gain from this,” but also observed that if the Board’s decisions were political, board members were careful to leave no evidence behind. Having presumably won the licence in January 1960 on the basis of merit — in the absence of any evidence to the contrary — the Misener group would have to work quickly to get their station on the air. The reason: There was competition coming from south of the border. In 1956, a group of investors associated with a Grand Forks radio station won permission from the U.S. Federal Communications Commission to construct a new Channel 12 TV station in the tiny border town of Pembina, N.D.
Their goal, however, wasn’t to serve Pembina and the sparsely populated surrounding area. It was to serve Winnipeg audiences, 100 kilometres to the north, and hopefully make some money satisfying Canadians’ insatiable appetite for American TV programming. The station was slow to get to air, though. It wasn’t until early 1959 — nearly three years after they were awarded the licence — that the serious work of building studios and erecting a tower got under way. Now with a second Winnipeg station under construction at Polo Park, it became urgent for the Pembina operation to finally get up and running. Thus began a mad race between the owners of Channel 7 and Channel 12 — which would become better known as CJAY-TV and KCND-TV later in the year — to beat the other station to air. “The idea of KCND was to come into the (Winnipeg) market as the second station, but in the interim the licence was granted to CJAY, so they were building at the same time,” former KCND-CKND employee Dorothy Lien told the Winnipeg Free Press in 1989. The race was as close as one got to a photo finish in the broadcasting industry. On Sunday, Nov. 6, 1960, Winnipeggers noticed a test signal coming in from Pembina on Channel 12. On Monday, Nov. 7, the half-finished station went on air at 6 p.m. with a limited program selection, owing to the fact that the station was literally not yet connected to the ABC and NBC networks from which it would obtain most of its programming. Given that the only other option in Winnipeg was to watch the CBC station, viewers weren’t exactly choosy. Five days later, at 5:30 p.m. on Saturday, Nov. 12, 1960, CJAY-TV Channel 7 signed on from a brand-new studio next to Polo Park Shopping Centre. Though CJAY had lost the race to air, it still had a decided advantage over its cross-border rival. KCND had been modeled after KVOS-TV, a small outlet in Bellingham, Wash., just across the border from Vancouver, which discovered that there was big money to be made in buying programs at low Bellingham rates and selling advertising at high Vancouver-Victoria rates. The practice was controversial, given that KVOS was at times selling advertising on programs for which a B.C. broadcaster had supposedly purchased “exclusive” rights; but it also made KVOS one of North America’s most profitable TV stations for a time. But there was a critical difference between KVOS and KCND. KVOS’s transmitter was only 70 kilometres from central Vancouver and just 45 kilometres from Victoria, close enough to put a strong and clear “Grade-A” signal into those communities, as it still does today. KCND’s transmitter was 100 kilometres from central Winnipeg. Its “Grade-A” signal only went as far north as Niverville, beyond which ground clutter and weather tended to interfere with reception. Given that there were no cable systems in Winnipeg at the time, it was an oversight on the part of the station’s owners that threatened to bankrupt the station. “We weren’t getting the dollars we needed out of Winnipeg to sustain the station,” Christenson said, describing the station’s financially troubled early years. The station’s fortunes dramatically improved after the arrival of cable TV in Winnipeg in the late ’60s. KCND’s survival in the early years was no doubt driven by the fascination that many Manitobans had for the glamour of Kennedy-era America and a yearning for something different on their screens, which led to a cult following in Winnipeg. “My dad’s bedroom TV had only local stations, but he got channel 12 by installing an interior Channel 12 Antenna… sometime in ’71 or ’72 but we weren’t allowed to use his TV. My younger brother used to sneak in there and watch reruns of ‘Lost in Space’ at 6 PM while my dad was working evenings,” Rob wrote. “Sometimes my dad called us to his bedroom to watch ‘Chiller Thriller’ at 10:30 PM Saturday night,” he added, referring to the station’s popular Saturday night horror movies. On the Canadian side of the border, CJAY-TV was not only putting a cleaner signal into Winnipeg, but also benefitting from its ability to purchase programming from all three U.S. networks between its commitments to the CTV Network, which it joined as a founding member in 1961. CJAY also had a wide range of local programs, many of them live. This made early local TV unpredictable and, at times, hilarious. Pranks were also common. CJAY sportscaster Jack Wells was the victim of one prank where the telephone that was placed on the news set for decorative purposes started ringing while he was on the air. “I just picked it up and said, ‘OK honey, I’ll be home for dinner in about 20 minutes,'” Wells told the Free Press in 1989. “Let’s not tell those stories, Al,” host Ray Torgrud interrupted. Another favourite victim of pranksters at CJAY was “Uncle Bob” Swarts, who hosted a popular children’s show called Archie and his Friends from 1965 to 1986. In the same May 1989 interview — just two weeks before Swarts’s death on June 9, 1989 — Harland recalled an on-air prank where one of the puppets, a dog named Petite, was the victim of a gunpowder-filled birthday cake that exploded as the puppet leaned over to blow out the candles. Today, there are still sites on TVarchive.ca, Yahoo Groups and YouTube paying tribute to Swarts. In spite of the early bloopers and financial struggles, both stations survived. The Moffat family, which owned CKY Radio for decades and were early investors in CJAY, bought out the station’s other owners in 1973. For consistency, the Moffats rebranded CJAY-TV as CKY-TV on June 1, 1973. The station remained in its original Polo Park studio until relocating to downtown Winnipeg in 2006. Canwest Broadcasting, headed by Paul Morton, Izzy Asper and Seymour Epstein, took over KCND in late March 1975 and proceeded to consolidate the station’s Pembina, N.D. and Winnipeg studios (then located at Portage and Winchester in St. James, but deemed unsuitable for Canwest’s needs) under a single roof on St. Mary’s Road in St. Vital. 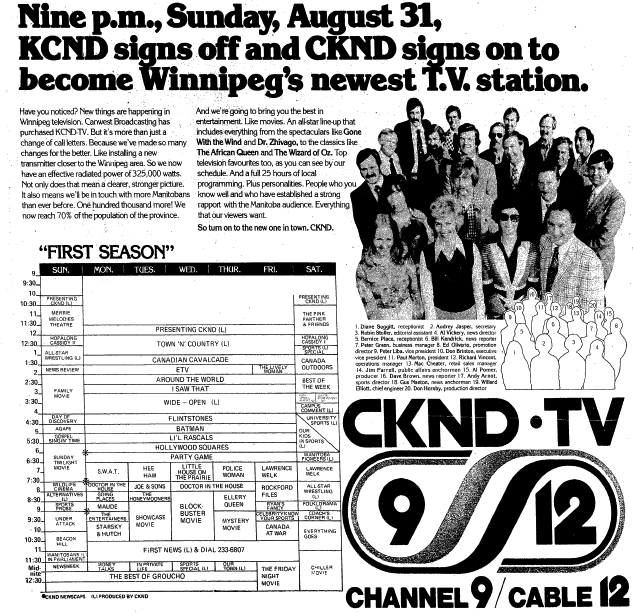 The rebranded all-Canadian operation took to the air as CKND on Aug. 31, 1975. It’s not video, but it’s probably the only known surviving trace of KCND-TV: a 25-second audio clip from a 1974 public service announcement.